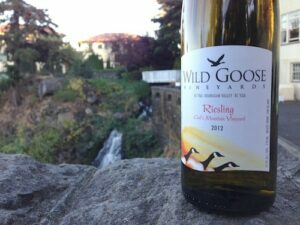 The top wine in the Great Northwest Invitational Wine Competition was Wild Goose Vineyards‘ 2012 God’s Mountain Vineyard Riesling from British Columbia’s Okanagan Valley. This came as no surprise to us as Wild Goose has been crafting some of the Pacific Northwest’s best wines for years. The winery operated by brothers Hagen and Roland Kruger is a past Pacific Northwest Winery of the Year with Wine Press Northwest magazine. This is the final vintage for this particular vineyard-designated Riesling for Wild Goose, as the viticultural practices changed and the Krugers are now choosing to focus on their own Stoney Slope Vineyard, which was planted 30 years ago. 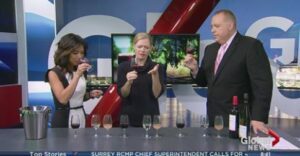 In addition, Wild Goose’s Gewürztraminer also won a gold medal – again, little surprise because of the stunning acidity available in the Okanagan Valley. 2012 Red Horizon Meritage Wins Gold! The second vintage of Wild Goose Horizon Meritage Blend wins Gold at the 2014 BC Wine Awards; it was the only Meritage Blend to win a Gold at the competition. Winemaker Hagen Kruger confirms, “This is an outstanding achievement for Wild Goose. We’re thrilled that our meritage blend is gaining recognition in this category.” The Red Horizon Meritage is made in a traditional style blending Merlot Reserve (made from 100% free run juice), Cabernet Sauvignon, and Petit Verdot. Earlier this year Wild Goose Winery became a member of the Meritage Alliance based in Calistoga, California. The Meritage Alliance is an association formed to identify and promote handcrafted wines blended from the traditional “noble” Bordeaux varieties. Wild Goose also took home a Gold for the Classic Pinot Gris and Silver for the Autumn Gold and Mystic River Pinot Blanc as well as several Bronze medals. Visit the BC Wine Awards for a complete list of winners. https://wildgoosewinery.com/wp-content/uploads/2015/04/wildgoose-logo.png 0 0 admin https://wildgoosewinery.com/wp-content/uploads/2015/04/wildgoose-logo.png admin2014-10-16 22:39:552014-10-16 23:05:532012 Red Horizon Meritage Wins Gold!